The Sohnrey family has been farming for five generations in California, they grow a wide range of crops including almonds, rice, prunes, walnuts and hay. They package their own line of seasoned almonds and sell them through their store and website, they also package their own rice. 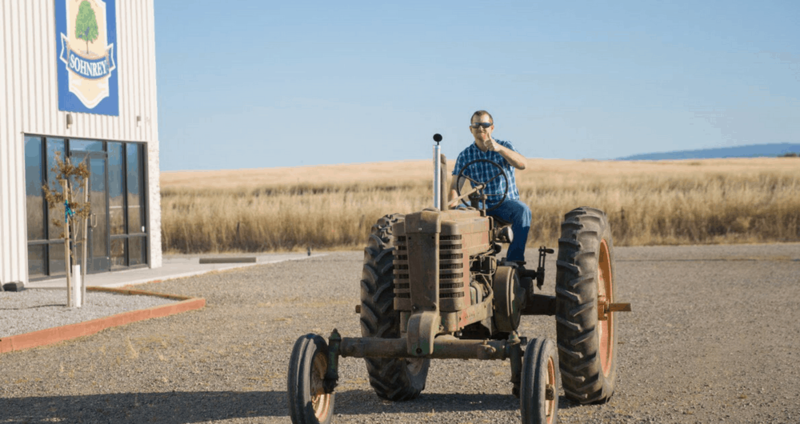 Andrew Sohnrey is keeping the farming tradition alive by farming alongside his family in beautiful Northern California where he manages the farm and helps in the store. Andrew: Today I am paying bills, doing some irrigation, flooding the rice post harvest, cleaning equipment and helping out in the store. Andrew: I would say harvest is my favorite part, for a couple of reasons. It’s super busy and I like being busy all the time. It is very satisfying to see all the hard work we put in over the year turn into a finished product. Andrew: In a few different ways, we like to donate when we can. We donate gift baskets to local groups for fundraisers. We like to focus on the kids because we feel they are our future. We make hay donations to local 4H clubs. Andrew: I’ve been farming since I was 7 or 8 years old. After graduating from high school, I wasn’t sure if I wanted a career in agriculture. As I started community college, I continued to work on the farm. Being on the farm, from planting to harvest (beginning to end), I just fell in love with the farming process. After a few years, I just knew that the farming life was what I wanted. Although it is necessary to be inside at times and take care of the business end of farming, I much rather be outside on the farm. Andrew: I am a big sports fan in general and I especially enjoy snowmobiling. If I’m not at work, I love spending time with my family and kids. Being a farmer, you are at work a lot so family time is my favorite time. As long as I’m with my kids and my family I’m as happy as a clam. Andrew: That’s kind of a tough one. It’s hard to get into farming anymore, because of the cost of the land, and equipment. If you don’t have much experience and want to try farming, work on a farm and learn the trade. Always start slow and small. Lease land and rent equipment if needed. CA GROWN: What do you do on your farm to be sustainable? Andrew: Our big thing right now is water conservation. When we plant new trees, we transfer everything to drip irrigation to conserve water. We use a system of censors that tell us how much water is being removed from the tree so we can make better use of our water. With rice, at the end of the season, we chop and disk the ground. Then we take a big roller and compact the dirt to conserve water. This saves about 4-6 inches of water per acre when we flood the rice fields. We farm 1,800 acres of rice so the water saving is substantial. We use GPS technology to save fuel on the tractors. We also use GPS systems to apply fertilizer and herbicides which controls the exact amount needed.